A Pittsburgh Plumber LLC Gas Line Replacement Page. Gas Line Services for all of Pittsburgh. Has your Gas Line been red tagged by the gas company? Have you been told that you must dig up your gas line to have it replaced or repaired? Get a bid from our gas line experts at A Pittsburgh Plumber! Call Us Before You Dig. We have been able to install or insert gas lines for a fraction of the cost of other companies. Gas Line Installation is now regulated by the Department of Transportation as well as the gas company itself. To get your gas turned on requires certification from the entities to be done right. 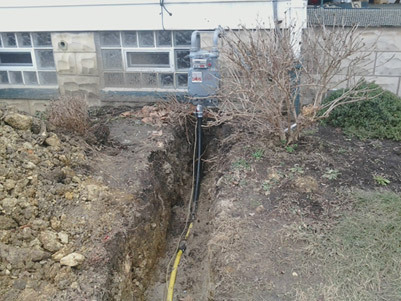 Our 50 plus years of experience has taught us that most gas lines can be installed without major digging. Gas Line Pipes break and deteriorate from time to time. Rest assured when you call A Pittsburgh Plumber at (412) 341-7586 you will receive quality service and fair pricing. Typically, when a gas line fails it is due to one of the causes listed above. While every gas line installation is unique, there are a handful of solutions that can handle almost every situation. In all cases our highly-experienced and well-trained gas line experts at A Pittburgh Plumber can repair or replace your gas line at affordable pricing. We provide you with the most timely and cost-effective solution, often for hundreds, sometimes thousands, less than the leading competitors. The construction material your gas line piping is made from has a large effect on how long your gas line lasts. Older pipe made of black steel and wrapped steel lasts for years but when it fails, the gas line needs repaired or replaced. Climate and construction methods of backfilling have a great deal to due with gas line piping failure. Today's Plastic Gas Line piping (seen above) is made of plastic construction and engineered to last many decades. Don't be fooled by the big box plumbing companies who charge a fortune. As mentioned before we are able to replace or repair gas lines at a reasonable price. Call The GAS LINE REPLACEMENT EXPERTS at A Pittsburgh Plumber for professional Pittsburgh Gas Line Evaluation and Installlation!